Vampyr, the next game from Remember Me and Life is Strange studio Dontnod, was first announced way back in 2015. Since then it's been lingering in the shadows, only popping up once in a blood moon to show off how far it's progressed. With a spring 2018 release window looming, Dontnod has once again invited would-be players to explore its vision of early 20th century London in a new series of behind-the-scenes videos. 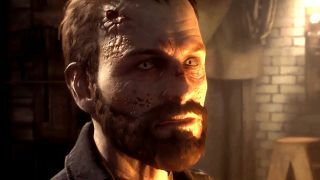 The first, released last week, is a basic introduction to the concept behind Vampyr: you play as Jonathan Reid, a doctor who is also a blood-sucker. You have a Hippocratic Oath to do no harm, but you require the life force of others to survive. While Reid struggles with this moral dilemma, the Spanish Flu sweeps through London, and a new variant of vampire also experiences a surge in population. But it's the second video in this weekly series that should get your blood pumping. We start with a tour of Dontnod's unique take on London, and the various districts it will portray. The team visited the actual city for inspiration, but so much of it has been rebuilt over the years. So Vampyr's version of London is just realistic enough to convince you it's a real place, but also infused with artistic flourishes to keep you intrigued. Or as one member of the team puts it, the game's world balances comprehension and intrigue - what did you see down that alleyway? Is that figure in the fog friend or foe? The video also gives us a sample of what to expect from the game's sound design, with lots of industrial clangs and bangs, underscored with a solemn, mournful cello. It reminds me a lot of the type of 'music' you'd hear in the background of a Hannibal episode, haunting and distorted but also kind of beautiful in a way. I hear it and it assaults my ears, but like, in a good way. I don't know if I should feel a sense of awe or fright, and that is a very good thing for a vampire game to inspire. We still have to see how the final product fits together and how well it plays before rendering a final verdict, but in terms of atmosphere and artistic expression, these videos make Vampyr look like something special. There are two more videos in the series, which will be released February 1 and February 8. I know I'm gonna be tuning in.